It had always promised to be an incendiary tie and, for 90 minutes, it looked as though it would be celebrated for the football, which was fast, open and exciting. West Ham United finally delivered the performance that they had wanted to electrify their new stadium and they put themselves on the right side of the result, too. They are into the quarter-finals of the EFL Cup, where they will face Manchester United at Old Trafford. But all of the good things from West Ham and Chelsea would be marred in stoppage time during a couple of minutes when supporters from both clubs hurled insults and projectiles � including coins and a couple of ripped-up seats. The trouble had flared when Chelsea fans made for the exit at the back of the lower tier of the Sir Trevor Brooking stand and some of their counterparts from West Ham moved towards them. The stewards fought to keep them apart but, with a bottleneck having formed, the situation very quickly came to look very ugly. Slaven Bilic�s reaction during his post-match press conference said it all, after he was asked, on the second question, to talk about the crowd trouble. Exasperation did not begin to cover it. �This game deserves to be talked about a little bit more,� he said. He was right, because it was a thriller. And yet, when such a substantial number of supporters can behave in such a bone-headed manner, the prominence afforded to the bad stuff comes with a grim inevitability. There were 11,000 empty seats in the stadium for various reasons, with one of the theories taking in the reticence of some fans to attend, given the possibility that there would be problems. There had already been disturbances in the stands and outside the ground at some of West Ham�s previous home matches. And this was Chelsea � not Bournemouth or Watford. It remains incongruous to see West Ham playing in this vast bowl, in which the noise can often appear to drift away on the breeze but there was a good atmosphere at the outset, and the tie crackled to life when Cheikhou Kouyat� opened the scoring. Chelsea had looked comfortable but they were rocked by Kouyat�s goal and it was because players are simply not supposed to score with headers from just inside the penalty area. The defender met Mark Noble�s cross, after West Ham had recycled a corner, with astonishing power and he brought the precision, too. Kouyat� had been two yards inside the Chelsea box and his effort kissed the inside of Asmir Begovic�s post on its way in. John Terry, back in the Chelsea team for his first action since 11 September, had been the blue shirt closest to Kouyat�. The tone on the field had been set by a 50-50 challenge between Noble and Gary Cahill in the first minute � neither player held back � and it was one of those games that featured so many subplots. It felt unusual, for example, to see both teams in a blood-and-thunder English cup tie playing with three-man defences. Antonio Conte had made seven changes from Sunday�s home win over United and they created chances at the outset. Terry converged onto a Willian corner to touch over the crossbar while N�Golo Kant� burst into the area, checked and shot. Darren Randolph, who started ahead of Adri�n, made a smart save to his right. Kouyat�s moment of brilliance had a liberating effect on West Ham, and they had the opportunities to add to their lead during the first half. West Ham appealed in vain for a penalty when Kant� nibbled at the back of Dimitri Payet but the ball ran on to Michail Antonio and, gloriously placed, he swept narrowly past the post. Manuel Lanzini flicked wide with his outside of his right boot, from Antonio�s low left-wing cross, when he might have been better advised having a swing with his other foot and both Payet and Pedro Obiang worked Begovic before the interval. Chelsea had plenty of opportunities, too, and they could not understand how they were not rewarded before the break. Nathaniel Chalobah tested Randolph from distance and Kant� might have shot, when well-placed on the left-hand side of the area, rather than looking for a cutback. Michy Batshuayi lifted over from Oscar�s low cross � a bad miss � and Oscar himself then watched a toe-poked shot deflect just wide. West Ham took charge early in the second half and it was a moment that Edimilson Fernandes will always cherish. The 20-year-old summer signing from Sion, who was making his fifth appearance for the club, collected Noble�s square pass, cut inside and drove a low left-footed shot into the far corner. 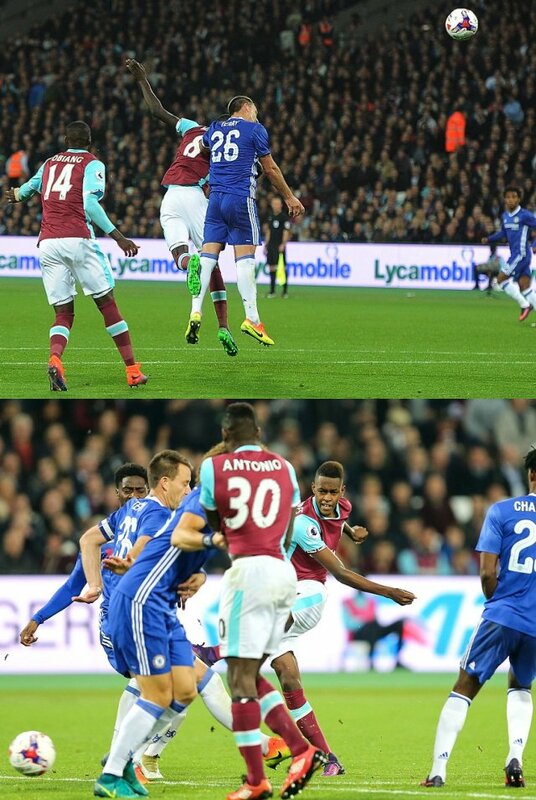 Chelsea thought that they had wriggled off the hook after Begovic had blocked from Payet at close quarters, following Antonio�s cross, but Aaron Cresswell won the ball back from Kant�s clearance and he moved it on to Noble. The stadium roared when Fernandes found the net and it felt like a golden moment for West Ham. Conte sent on his big guns � Diego Costa and Eden Hazard � while Pedro also came on for the left wing-back, Ola Aina. The manager could be pleased with the never-say-die spirit of his players. They pushed until the end, and they created a flurry of chances. Oscar felt that he should have had a penalty for handball against Kouyat� while Willian dragged wastefully wide, Hazard hit the top of the post and Costa lifted over Randolph but wide of the goal. At the other end, Payet shot high on the break before Cahill got one back at the very last following a Willian free-kick. By then, however, the trouble had kicked off. The occasion would take on an altogether different feel.